UH's Eli Christensen scored ahead of the throw to Sacramento State catcher Buddy Morales in the fourth inning last night. The Hawaii Rainbows made the most of their first five hits to score all of their runs in a 5-2 victory over Sacramento State in a Western Athletic Conference baseball game last night at Les Murakami Stadium. The biggest crowd (3,411) of the season watched the Rainbows (31-12 overall, 9-6 WAC) win their fourth league series and move into a first-place tie with Fresno State. Justin Costi and Tyler Davis combined on a five-hitter, with Davis earning his second save of the season. Fifty-four of Costi's 89 pitches were strikes and he threw first-pitch strikes to 16 Hornets. "Justin took himself out of the game. He said he was losing his command. That is a senior with maturity. We had no problem going to the 'pen," said Hawaii coach Mike Trapasso. Brian Blauser gave the Hornets (20-26, 8-9) a 1-0 lead in the second when he hit his team-leading eighth home run, a leadoff shot over the left-center-field wall. The Rainbows quickly responded with three runs in the bottom of the inning. With one out, Sacramento State starter Mitch Lively hit Esteban Lopez with a 2-2 pitch. Lopez took second on a wild pitch and moved to third when Jon Hee beat out an infield single to the second-base bag. Lively's wild pickoff throw to first scored Lopez and allowed Hee to advance to third. Robbie Wilder walked on a 3-1 pitch. Derek DuPree then turned on a 2-2 pitch and drove it off the base of the right-field wall for a two-run double to give UH a 3-1 lead. "It was a slider, inside," said DuPree. "I had two strikes, so I was just looking for something over the plate." The 'Bows increased their lead to 5-1 in the fourth. 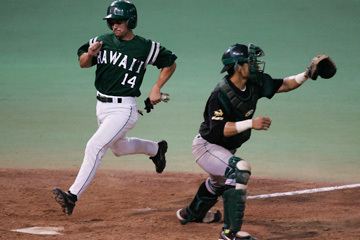 Hawaii second baseman Jonathan Hee leaped over Sacramento State's Everet Rincon, who was safe in the fifth inning. Eli Christensen reached second on a throwing error by Lively, moved to third on a wild pitch and scored on Hee's bloop single to center. Wilder doubled to right, sending Hee to third. Hee scored on DuPree's groundout. "I thought we had a better approach (at the plate) tonight. We had a better mind-set and better dugout demeanor," Trapasso said. "We got some big hits when it counted. It was a team effort. We had that look in our eyes and I hope we can do the same tomorrow." The Hornets cut the deficit to three runs when Brian Conradi walked, stole second and scored on a single to center by Everet Rincon in the fifth. Costi allowed just four hits in his seven innings of work. He walked one. Of the 21 outs the senior right-hander recorded, six came on strikeouts and nine were via ground balls. "Justin keeping the ball down was crucial for us," said UH pitching coach Chad Konishi. Davis, who threw strikes on 17 of his 22 pitches, retired six of the seven batters he faced, allowing only a bloop single to Pat Keiper to start the ninth. Between Costi and Davis, only three Hornets reached second base, with two of them scoring. Hawaii's streak of consecutive innings without an error ended at 41 when Hee dropped the ball as he took it out of his glove to throw to first on Rincon's ground ball in the third inning. Note: Prior to the game, Wally Komatsubara was presented with the 19th annual Chuck Leahey Award for outstanding services and contributions to the game of baseball. Komatsubara is a longtime professional scout and has spent countless hours of his own time assisting coaches in the proper preparation of baseball fields. Sacramento State at Hawaii, 1:05 p.m.
E--Lively 2, Hee. LOB--Sac. St. 4, Hawaii 7. 2B--Blauser, Wilder, Dupree. HR--Blauser. SH--Dupree, Lopez. SB--Conradi, Rincon, Wilder. CS--Rincon. WP--Lively 2. HBP--by Lively (Lopez). Umpires--Steve Mattingly (plate), Mark Denzin (first), Jim Garman (third).